Blackmagic Design has released DaVinci Resolve 16 beta yesterday with new exciting features like neural engine with face recognition, new cut page, and more. DaVinci Resolve is a professional color correction and video editing application for Windows, macOS and Linux. Two versions are available: a commercial version called DaVinci Resolve Studio, and a free edition, formerly known as DaVinci Resolve Lite. One of the major new features in DaVinci Resolve 16 (beta) is a new cut page, designed for speed. This is an alternative edit page with a streamlined interface that lets users import, edit, trim, add transitions, titles, mix audio and more. 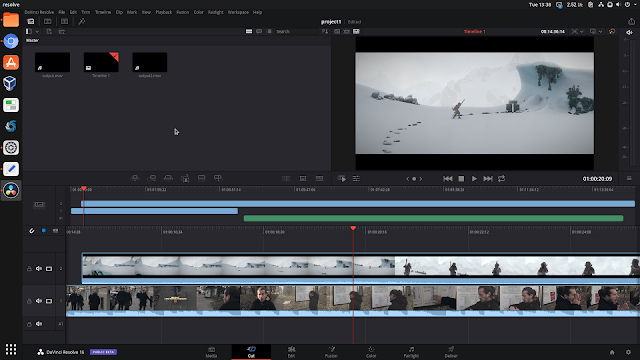 It also sports a dual timeline to edit and trim without having to zoom in or out, which is usually very slow. The regular edit page is still available in DaVinci Resolve 16 in case you want to continue using it. DaVinci Resolve 16 also includes deep neural networks and learning, along with artificial intelligence, for features like speed warp motion estimation for retiming, super scale for up-scaling footage, auto color and color matching, facial recognition and more. As an example, it can make use of facial recognition to automatically sort and organize clips into bins based on the people it detects. Built-in tools for retime, stabilization and transform. For a complete list of new features see the release announcement. DaVinci Resolve officially supports CentOS / RHEL7 only, but it's possible to install it on other Linux distributions, although it's quite tricky. To make it easier to install on Debian, Ubuntu and Linux Mint, there's a script that generates a DEB package, about which I wrote in the past. On Linux, the free version of DaVinci Resolve 16 (beta) does not support H.264 and H.265 video codecs, and AAC audio codecs (among others), most probably due to legal reasons. You also have to consider the fact that DaVinci Resolve is especially designed for cinema and professional editing, where h264 is rarely used. You can transcode unsupported videos to a different format using ffmpeg. This article has some ffmpeg commands that you can use to convert videos to a format / codecs supported by DaVinci Resolve. The commercial DaVinci Resolve Studio version supports h264 in some cases on Linux, but only for decoding, according to this PDF (it's for the old DaVinci Resolve 15). It's also worth noting that on Linux you'll need to have an Nvidia graphics card which supports CUDA 3.0, and proprietary Nvidia drivers. There is a report that it started working with AMD graphics, but I can't try this myself as I have Nvidia graphics on my computer. Downloading the application requires registration. Since publishing this article, the script that can be used to generate a DaVinci Resolve DEB package for easy installation (and removal) in Debian, Ubuntu and Linux Mint, has been updated to support the latest DaVinci Resolve 16 beta. Check out the How To Install DaVinci Resolve 16 Or 15 In Ubuntu, Linux Mint Or Debian (Generate DEB Package) article for complete instructions.